Let’s take a walk over to this charming home. 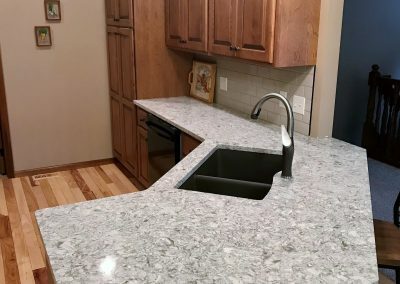 These homeowners have lived in this home for several years and recently decided it was time to remodel the home starting in the kitchen. 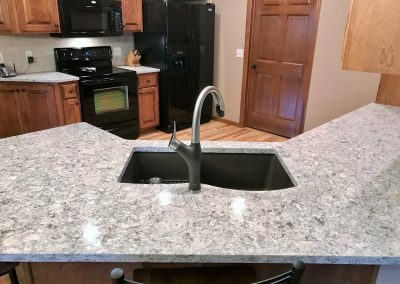 When looking for countertops, they wanted a product more durable and with less maintenance than what they previously had. That became an easy decision after hearing the benefits of Cambria. The Cambria design decision was an enjoyable process. 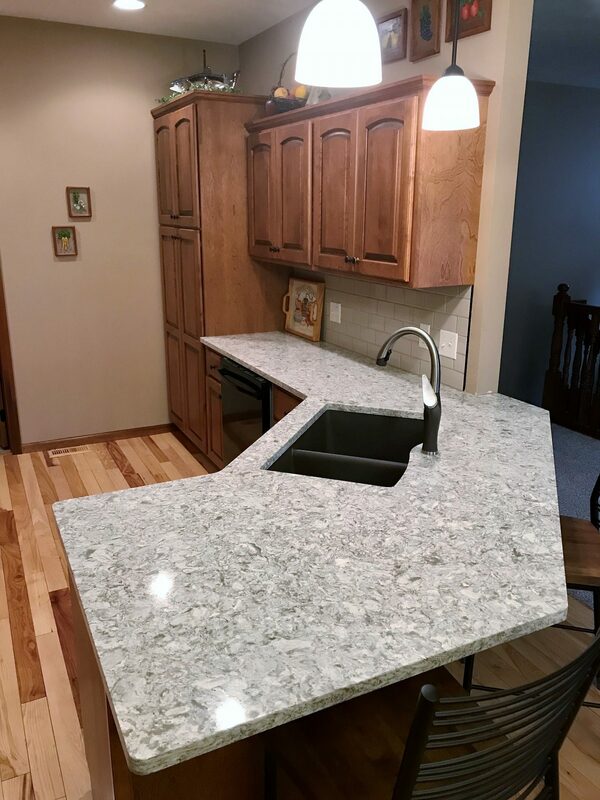 They wanted a design that would compliment their existing cabinets with a beautiful honey stain; and a design that would give their kitchen some life. After looking through several options and taking several samples home, the decision was made Cambria New Quay it is! The rolling movement of New Quay abounds with foggy grays bespeckled with silver and black, much like the picturesque houses that cling to the rolling coastal shores. Cambria New Quay is just one of several Cambria designs showcased at Creative Surfaces Countertops & Tile. With over 160 designs to select from we are certain you’ll find the design that fits your needs and style; and will give your kitchen that WOW factor. 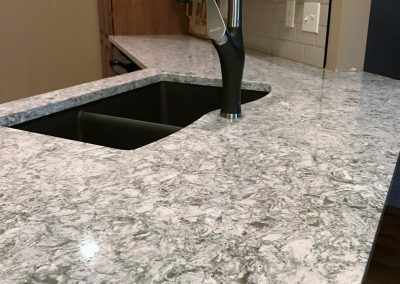 Visit us, let one of our designers assist you in selecting the best Cambria design for your project. In the end, you’ll love it. We promise! Cambria New Quay countertops with 3×6 subway tile. 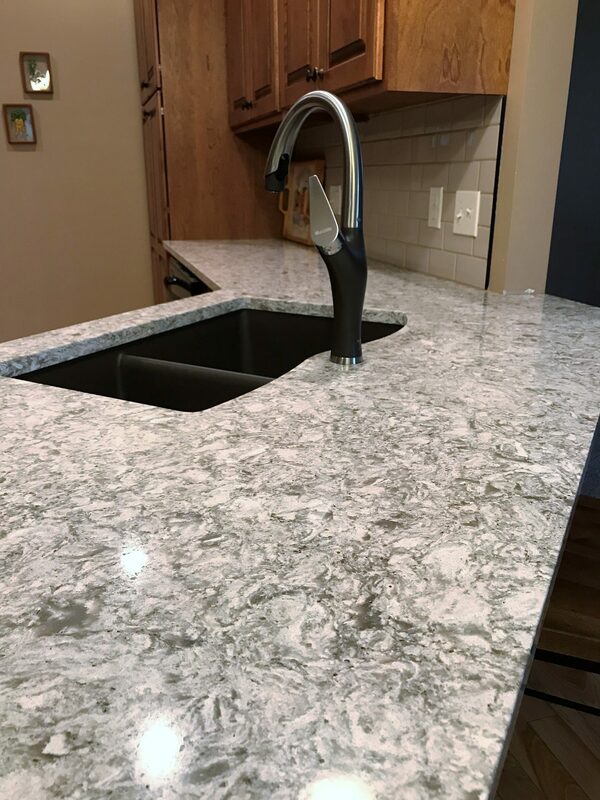 Camnbria New Quay countertops with Blanco undermount sink.